We have wondered around Shoreditch quite often, but never have I thought longer than a second or two about the different ‘illustrations’ on the walls all around. Now I can proudly say I don’t just notice more but also recognise many famous artists’ works in those ‘illustrations’. It is just not about graffiti, you will learn that there is a difference between graffiti writers and street artists. I have never been a big fan of the first, but i must say I was quite fascinated by the latter. Street artists the same way as all the other artists are influenced by portraiture, surrealism, pop art etc. There are lot of narratives and symbols that tell a story behind this fascinating culture. Banksy is one of the most renowned and famous contemporary artists in the world. 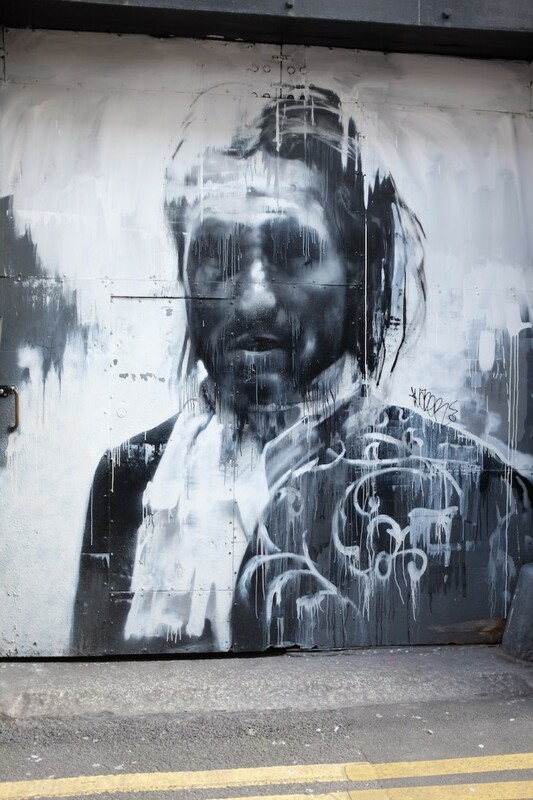 He is far from being just a graffiti artists, he is also a political activist, film director, and painter. Nowadays many of his works are protected and they are selling for hundreds of thousands of pounds. 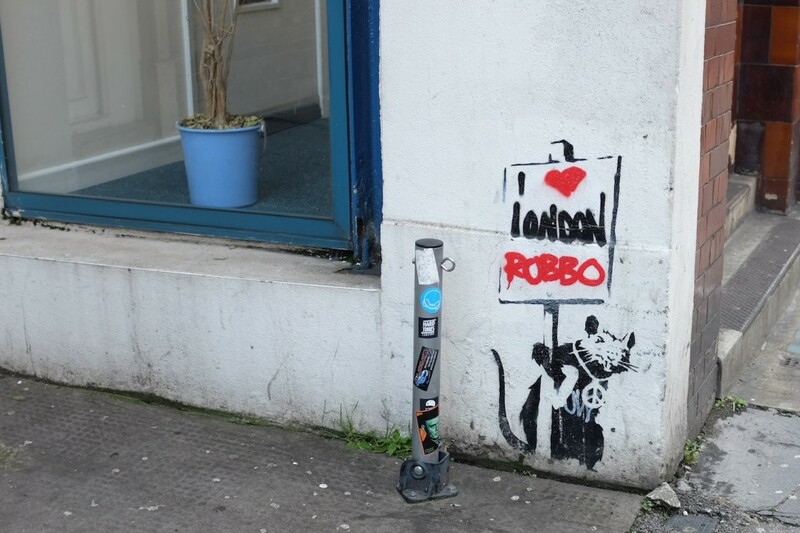 The above photo shows an original Banksy work altered by his rival Robbo, whom he was on a graffiti war with. The sign originally said ‘obviously something different’. 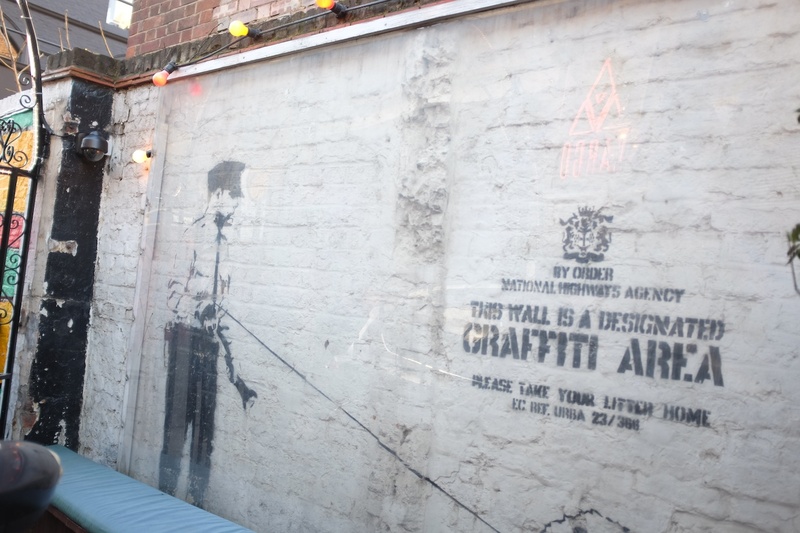 See below another Banksy work (behind the protective shield). 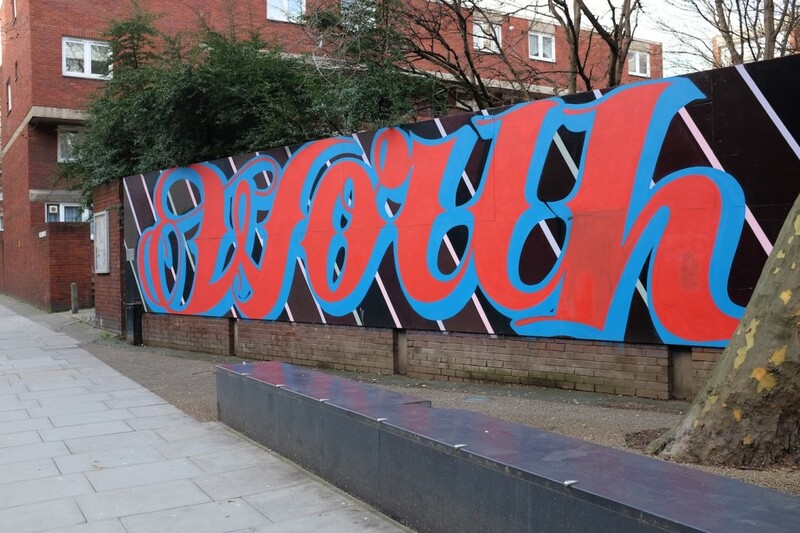 Eine was among the early pioneers of street art in Shoreditch. A painting by him was among the official gifts to Barack Obama from David Cameron on his first trip to Washington as prime minister. 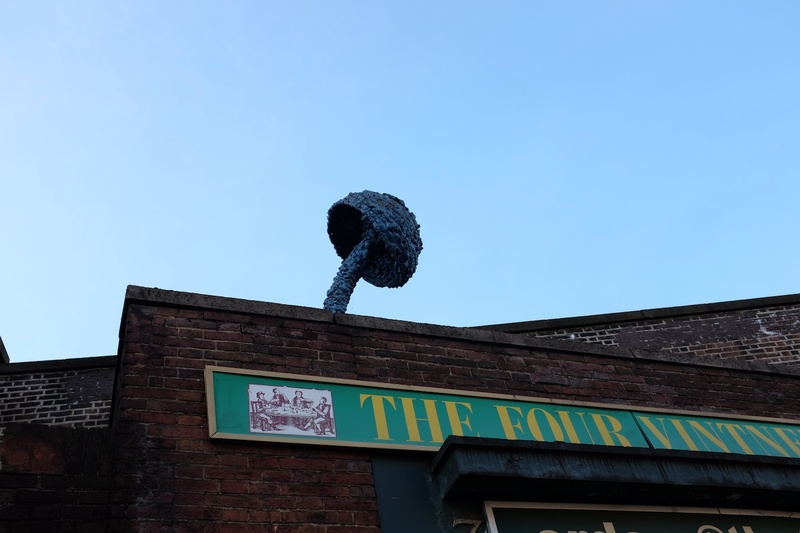 He has also worked with brands like Virgin Atlantic and was part of the project ‘Art in the skies’, where his work was literally in the air, on board of Virgin Atlantic planes. 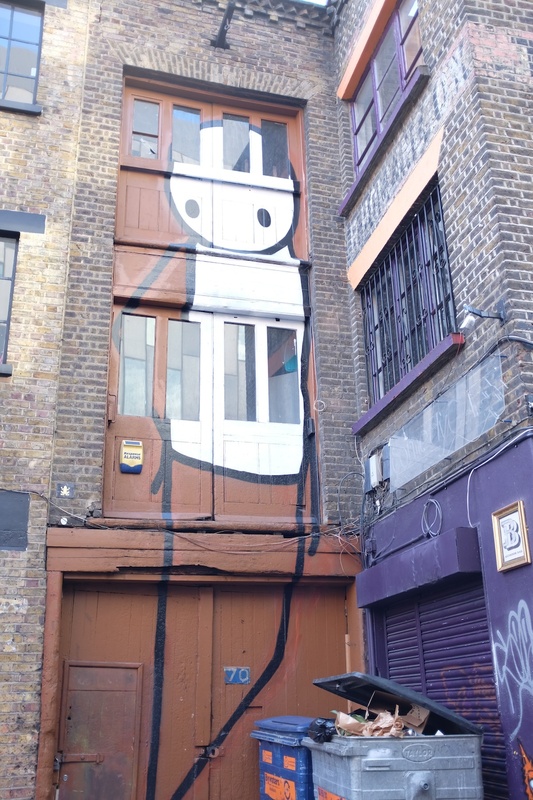 Stik was definitely my favourite street artist we came across the tour. He paints simple stick figures, who despite being very minimalist somehow manage to portray real emotions. It is the cute kind of street art that makes you think about everything nice and cuddly and does not convey an image of something illegal and dangerous at all. He started off as any graffiti writer, doing his work illegally but is now often invited to paint walls legally. Don has been painting on the streets for almost 30 years now. 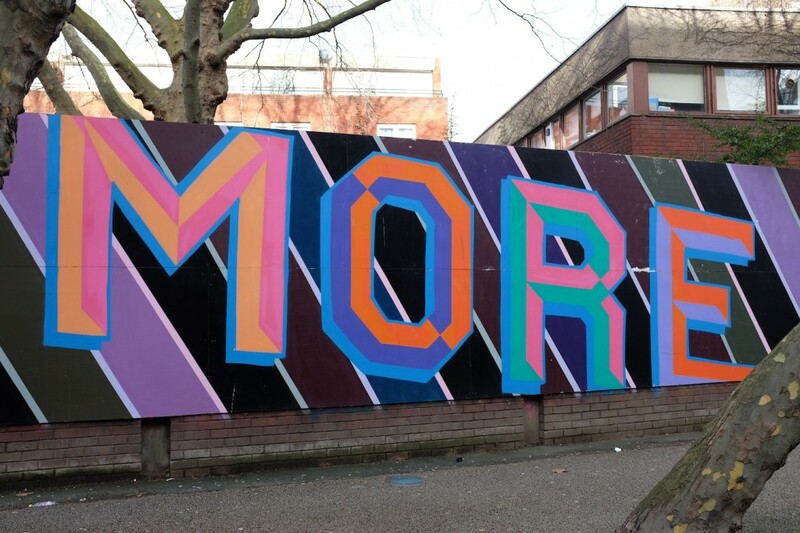 His works can be found all over Shoreditch and can be recognised by his multi-colored stencil and freehand sprayed backdrops. During the Olympics, Paul “Don” Smith was busy painting portraits of the Olympians. 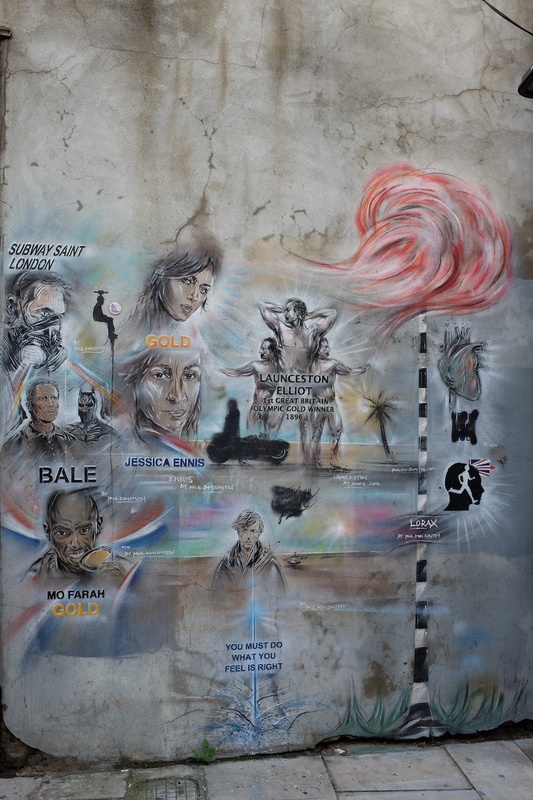 Some of these can still be seen on Hanbury Street. It all got started in Paris in 1998 and now Invaders can now be found in over 40 other cities throughout the world. 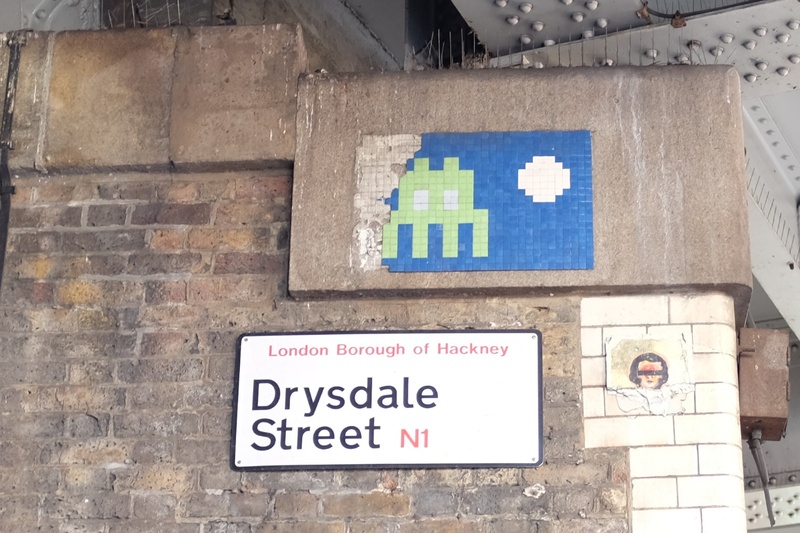 His style again is totally different from the rest, he uses tile mosaic in the shape of a space invader and glues those onto the walls (lately he has also been using different shapes). He is quite famous world wide, having made movies and put up exhibitions.